Unfortunately, you'll need to be in D.C. to experience it. Mario Kart 8 Deluxe is one of the best kids games, and best games period, on the Switch, filled with fast-paced action the whole family can enjoy as they race around the track as a variety of characters from popular Nintendo franchises, from Super Mario to Animal Crossing to The Legend of Zelda. As reported by Engadget (via Road to VR), players in the Washington D.C. area can now enjoy the thrill of Mario Kart in a whole new way — in virtual reality. The Mario Kart VR experience is part of Bandai Namco’s “VR Zone Portal,” and it will reportedly be available to play in Washington D.C.’s Union Station until March 2019. The game lets four players sit in models of the in-game kart vehicles, and use pedals and a steering wheel to control the action. Each player wears an HTC Vive headset (one of the more popular virtual reality headsets on the market), which lets them feel like they’re really in the in-game world. It wouldn’t be Mario Kart without collectible weapons that can be thrown at opponents, and these are in the VR game too. Only instead of simply driving over boxes to collect weapons, players need to reach out their hands and “grab” items using their hands. 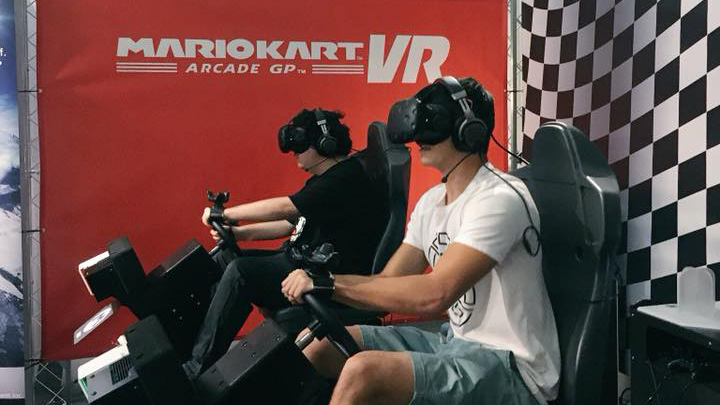 In addition to Mario Kart VR, the VR Zone Portal will let players try two other games, Argyle Shift and Ski Rodeo. As Road to VR reported, prior to now, these three experiences had only been found in Japan and the U.K.
Want to learn more about virtual reality and whether it’s safe for kids? Check out our guide. Top image courtesy of VR Zone Portal US Facebook page.